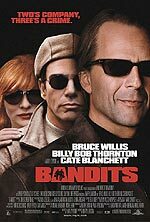 A true overlooked movie, Bandits is a gem waiting to surprise people. With a guy like Barry Levinson directing, having classic comedies like Diner and Toys, (another ill-received winner) under his belt and dramedies like Rain Man, you know you will be entertained. If you still feel unsure after finding out it stars Bruce Willis and two of the best actors working today in Billy Bob Thornton, (when not playing the vulgar schlub he has lately), and Cate Blanchett, you don’t enjoy cinema. This trifecta of actors really shine together causing laughs at every turn while still grounding the film enough to keep the serious criminal consequences relevant. Breaking out of jail on a whim, Joe (Willis) and Terry (Thornton) find themselves free men needing money. They decide to rob banks long enough to make a nest egg to run a hotel/club down in Mexico; yes that is where they are keeping Acapulco these days. They become the “sleepover bandits” as they kidnap the bank manager the night before the crime so as to take the money without hostages causing a problem. Just the satirical notion of these hardened criminals becoming overnight celebrities where bank managers revel in the thought that they can be victims, is funny enough. Throw in Cate Blanchett’s manic-depressive housewife on her last thread Kate, and we have some really laugh-out-loud hijinks. When she is singing to cheesy 80’s Bonnie Tyler music while cooking and driving, you can see the amazing comic timing she possesses to go along with the dramatic chops she usually shows. One of our most versatile actresses, maybe not quite deserving of the Oscar last year, but definitely worthy of the Oscar-winner status, there hasn’t been a bad performance by her that I have seen. I can’t wait until later this year when she joins heavyweights Alejandro González Iñárritu and Guillermo Arriaga with their emotional epic Babel. Bruce Willis shows again that playing against his tough-guy type is really where he succeeds best. Joe has all the charisma and muscle of an action hero, but also the sarcasm and wit to really poke fun at the stereotype. Thornton gives a magnificently physically showing as the hypochondriac Terry. His idiosyncrasies are hilarious to watch and the banter with both Joe and Kate is perfect. There are so many one-liners that spew from his fast-talking, too smart for his own safety mind. “You know the hardest thing about being smart? You pretty much know what’s gonna happen next. There’s no suspense.” He also has the uncanny demeanor to switch personas mid-sentence, acting tough and then, when ridiculed about his disguise, almost quietly, as though to a confidant, asking if it really is that bad. Rounding out the comic genius is relative newcomer Troy Garity. His stuntman is the ultimate stereotypical guy’s guy whom needs to be babysat at every turn by the two criminal minds. The childlike fascination is perpetually ingrained into his features and expressions as he is just a kid in a candy store. Garity’s charm makes the role successful and an integral part to the story. Credit writer Harley Peyton for loading his script with so many disparate characters which when mixed together work together like clockwork. 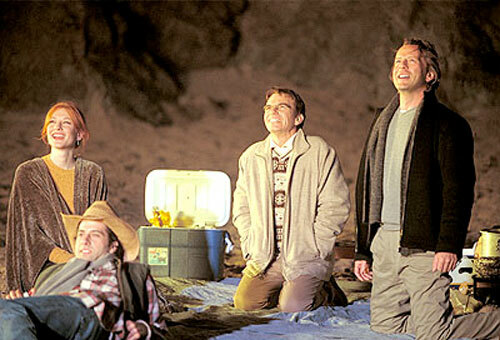 After writing ensemble work with quirky roles in the likes of TV show “Twin Peaks,” one can see why. Hopefully we will be able to see more from him in the future, and also more like this from Barry Levinson, who’s last film Envy was so bad it was released after a hiatus on the shelf for two years.